Creative multipurpose Responsive WordPress Themes, Landing Pages and Templates suitable for any kind of corporate business and portfolio websites. HTML5 coded and highly customizable with latest web technologies (CSS3, SEO Ready). All themes are comes with One Click demo install, unlimited Theme Options: colors, fonts, menus, sliders. Exclusive with Woocommerce, WPML, Chat plugin, Mailchimp, Mega menu and many more awesome features and plugins. All included for FREE. Most amazing responsive design WordPress themes built with best frameworks, HTML5 & CSS3, jQuery, and with SEO in mind it will help you get on top of Google Searches! the layout will adapt to different screen sizes which will make your website be compatible with any device such as smart phones, tablets or desktop computers. Odra is a high-end, one of a kind agency template that’s built with great care. With a lightweight and responsive Tera slider and custom-made lightbox built from scratch, plus a stylish way to present images with different aspect ratios in a Masonry-like portfolio, it is one of the most flexible and easy-to-use HTML templates out there. Nexus is Elegant & Creative Business WordPress theme which have many powerful features to allow you build websites very easy and unlimited your creative to make impressed websites. Scalia – Multi-Design Trendsetter Theme Get unlimited possiblies to customize the look of your website. Take design control on each & every element & page layout. Everything without touching a line of code. Stilo – is clean one page parallax responsive and retina ready WordPress Theme. It is great, professional and easy to use. You can use it for Photo Studio, Freelancers, Portfolio Theme, Creative Agency etc. 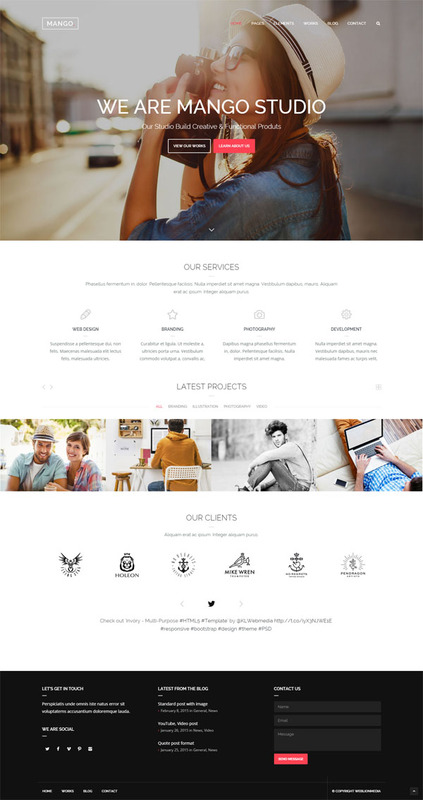 Alfa is a clean and professional, responsive one-page portfolio WordPress theme made for freelance web designers, freelancers, web agencies, artists and other creatives and entrepreneurs. Sanabel is a genuine multi-purpose theme which works for anybody to build anything he imagines, with Sanabel well crafted elements and ease of use you don’t need to be an expert in order to build a website, it’s really scalable and works for anyone. ENAX is a Modern One Page Parallax theme. This theme is Suited for any type of website, personal or business use, design companies, etc… Enax is designed with modern look and feel while keeping in mind user friendly and eye catching interface. Get the best out of your website and attract your visitors with this theme. Easy to setup and use, with lots of customization options available. Amber is the best choice for Luxury Service Providers and VIP businesses. It has Rental Service items with convenient modules for multiple characteristics, it has a WooCommerce Shop and of course events and other necessary content pages. Everything looks sleek and very easy to edit and set up due to Drag-n-Drop Visual Composer Page Builder that we use.